There are three parts to this assignment. To get full credit, you must submit four files to this Dropbox for assignment 8. You will be provided with a piece of text encoded using a single-substitution (monoalphabetic) cipher. Your task is to crack the code and discover the secret poem. You should start by doing a frequency analysis of the letters in your text. When finished, type in (or take a picture of) your decrypted text, and submit that to the Dropbox. If you type it in to a text document, name it “part1”. Choose a password that is 5–8 letters, and write it down. Write down a sentence that is about 4–6 times the length of your password. Use the polyalphabetic substitution table to encode the sentence using your password. Type the encrypted sentence and the password into a text file named “part2”, and submit that to the Dropbox. You’ll get full credit for this portion only if I can make sense of your sentence by decrypting using your password. So you may want to give that a test run with a friend: give them your encrypted sentence and password, and see if they get it right. Use some variant of GNU Privacy Guard (GPG) or Pretty Good Privacy (PGP). Here are some options, including the software download links and a video illustrating their use. 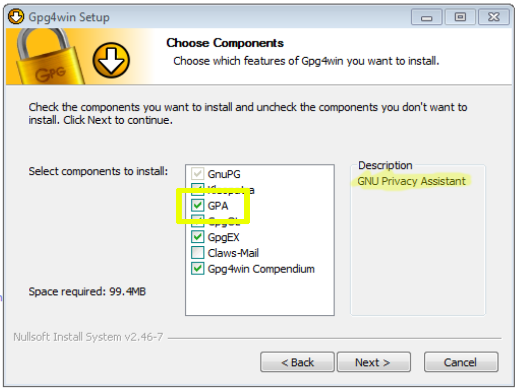 Software: http://www.gpg4win.org/ (free) Note: download the full version, and when you install, select ‘GPA’ (GNU Privacy Assistant) on the Choose Components screen. Import my public key, which you can get at that link, or by searching a key server for the ID 4F31B08B. Export your public key to a .txt file, and upload that file to the Dropbox. Compose a short message to me, then sign it with your key and encrypt it with my key. Upload the encrypted version of the message to the dropbox. Its extension is usually either .gpg or .gpg.asc.